These pages are devoted to liturgical works of various sorts, produced at various times. Unless they are specifically protected by a copyright, they are free to be used and copied. Priest: Let us pray. O merciful creator, your hand is open wide to satisfy the needs of every living creature: Make us always thankful for your loving providence; and grant that we, remembering the account that we must one day give, may be faithful stewards of your good gifts; through Jesus Christ our Lord, who with you and the Holy Spirit lives and reigns, one God, for ever and ever. Lector: "And I will make for you a covenant on that day with the beasts of the field, the birds of the air, and the creeping things of the ground; and I will abolish the bow, the sword, and war from the land; and I will make you lie down in safety." Here ends the reading. Priest: The Holy Gospel of our Lord Jesus Christ according to Mark. All: Glory to you, Lord Christ. Priest: "The Spirit immediately drove Jesus out into the wilderness. And he was in the wilderness forty days, tempted by Satan, and he was with the wild beasts; and the angels ministered to him." The Gospel of the Lord. All: Praise to you, Lord Christ. Priest: Holy God, bless this water with your grace that every creature upon which it falls may know your love and care for them. Amen. Deacon: We praise you for the creation of the world and all living creatures in the earth, sky and sea. All: Hear us, O God. Deacon: For the gentle eyes of the deer, the friendship of dogs, the purr of cats, the strength of bears, the beauty of a hippo, the humor of chimps, the intelligence of gorillas, the grace of dolphins, and the magnificence of whales. Help us to keep them safe. Deacon: Keep us mindful of the vision of the peaceable kingdom in which all living creatures dwell in harmony. Deacon: Help us to be kind and gentle like our Lord Jesus. 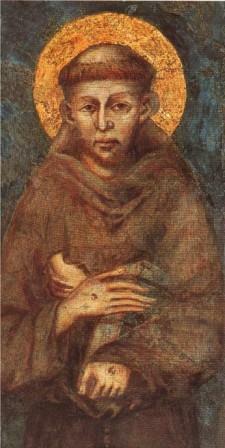 And may we remember St. Francis' love of animals whenever we see one of your creatures hurt, suffering, and in need of help. In Christ's name we pray. Priest: The Spirit of life is upon us. All: who gives breath to all creatures. All: and we feel the Spirit in our hearts. All: and all the creatures on the earth. Priest: Holy God, your Spirit fashioned us from the beginning, created us from the dust of the ground and breathed upon us; and all creation too was enlivened by your Spirit, free and abroad in all creation, making life by your work of love. Nothing living is untouched by your Spirit, or without your gift of grace. The earth is full of your treasures; great and small are the works of your hands. everywhere we behold your glory and the superabundance of your Spirit. By the same Spirit we are molded together into one fellowship of life; such is your pattern that everything speaks of you and every speck of dust is transfused with glory. You set us in the midst of life to care and serve; to walk humbly with you and trust in your Spirit; but we have betrayed that trust and have served ourselves, worshiping our own image and frustrating your Spirit within us. Only your Son filled with the Spirit has set us free and liberated us to walk again in newness of life; yet the Spirit of your Son stills cries in our hearts so that all creation may be free again with your love. Through the same creative Spirit we pray that these creatures of bread and wine may be to us the very life of your Son in flesh and blood; signs of life renewed for the whole creation. At the last supper, Jesus took bread and said "This is my body" and he took the cup of wine and said "This is my blood." As we remember your Son's saving work we pray that you will remember us and all creation when we come into your kingdom. Holy, Holy, Holy, you are the true life without end and for evermore. Amen. Priest: These are the gifts of God for the people of God. Take them in remembrance that Christ died for you and feed on him in your hearts with thanksgiving. All: Thank you, O God, for your abundant gifts: the world about us, our brother and sister animals, and for our life in Christ. Move us to share what we've been given in loving service and bearers of hope to all around us. In Christ's name and by the power of the Holy Spirit. Amen. Priest: May the blessing of God, Creator, Redeemer + and Sanctifier be upon you and remain with you always. Priest: Go in piece to love and serve the Lord.